Location targeting: Reach only those in specific geographic regions where you live or do business! You can target your ads by country, state, zip code, or area within a certain distance from your business address. This is a simple method that casts a wide net. Interest targeting:Reach specific audiences by looking at users’ self-reported interests, activities, skills, pages/users they have engaged with, etc. Interest targeting is often related to keyword targeting, so you can combine these targeting methods for better results. Behavioral/Connection targeting: With behavioral targeting, you can reach people based on purchase behaviors or intents, and/or device usage. With connection targeting, you can reach people who have a specific kind of connection to your page, app, group, or event. Both types of targeting take into account users’ past behavior to help you determine intent. Custom targeting: Reach audiences by uploading a list of email addresses, phone numbers, users IDs, or usernames. Facebook offers Custom Audiences, so if you have a known group of people you’d like to target, you can simply upload them and target them directly (provided that the social network can match the data you’re uploading with Facebook profiles). Lookalike targeting: Reach new people who are similar to an audience you care about. Lookalike targeting helps businesses extend their custom audiences to reach new, similar users. For those businesses looking to acquire new customers through social media advertising, lookalike targeting can be a fantastic acquisition tool. Remember: When you see a Facebook ad, it’s targeted to you and people like you in some way. Brides and grooms are likely not going to see the same ads as you see (unless you’re also getting married – congrats! ), so avoid spammy comments or links to your own website. 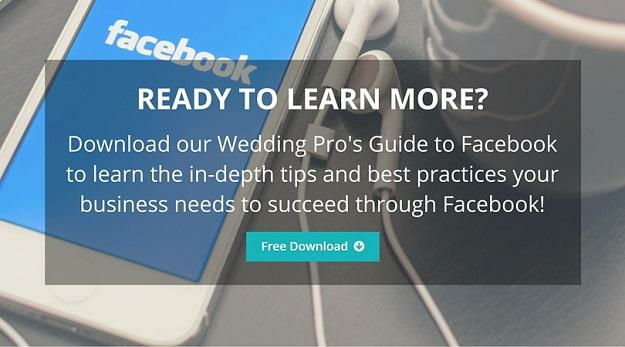 It’s likely that the only other people seeing your comments are other wedding professionals or small business owners. Not only can you target your ads by your desired audience, but you can also target your ads by your desired device type through your ad placement. Ad placements are where your ads can appear on Facebook, and there are currently three options: Desktop News Feed, Mobile News Feed, and Right Column Desktop. Desktop News Feed and Mobile News Feed ads are pretty self-explanatory – they appear within the News Feed on the desktop or mobile view of Facebook, respectively. Right Column Desktop ads appear on the right side of the News Feed on desktop view. These are more similar to classified ads, with smaller images and shorter amounts of text. You can select to display your ads on all of these placements, or only on one or two. While the ads look different in each placement, Facebook provides guidelines to ensure your ads will look great no matter where you want them. If you’ve never looked at your Facebook page Insights before, you’ll find them located at the top menu bar on your Facebook page. Only page administrators have access to these valuable insights, so visitors to your page will not see your page’s performance. Facebook Insights tracks and reports on a number of metrics and statistics, and you can track your advertising performance here as well. Read our full post on Facebook Insights to find out where to find what you’re looking for and what certain terms mean, or head to Facebook’s help center for Ads Reporting Basics. Facebook Ads are easy to set up and create, so once you’ve gained experience managing your business page, you may want to give their advertising platform a try to increase your reach and conversions. « Pricing Strategy: Is It Time to Consider a Change?